The very first Lamborghini Aventador SVJ has landed on Indian soil. Lamborghini Delhi has announced that the first ever Aventador SVJ has arrived in India and has been delivered to its respectful owner. The Aventador SVJ is the replacement for the Aventador SV and is a limited edition model which will only see 900 examples ever made worldwide. While ‘SV’ has always stood for Superveloce which means super fast, the ‘J’ suffix stands for ‘Jota’ which means that it is track focused. “A step into the future, the Aventador SVJ is for supercar enthusiasts who will appreciate this ultimate innovation. Equipped with the finest and the purest, the Aventador SVJ has already piqued the interest of Lamborghini owners in India. This is amongst the first few Aventador SVJ’s in the world and First in India and demonstrates the growing number of supercar aficionados in the country.,” says Sharad Agarwal, Head, Lamborghini India. The first Lamborghini Aventador SVJ in India being delivered to its owner. The Aventador SVJ features Lamborghini’s naturally aspirated V12 which is further tuned to produce 759bhp @ 8,500rpm and 720 Nm of torque at 6,750 rpm. The engine is mated to a seven-speed Lamborghini designed AMT gearbox. Completely drained of all fluids, the SVJ weighs just 1,525 kg. 0-100km/h takes just 2.8 seconds and it can accelerate from 0-200km/h in only 8.6 seconds. While the top speed of this Italian hypercar is an impressive 350km/h, its stopping power is also immaculate as it can travel at 100km/h and stop dead in its tracks in just 30 metres. However, the most extraordinary feat the SVJ has achieved is that it currently holds the road legal production car lap time around the Nürburgring Nordschleife clocking in at 6:44.97. 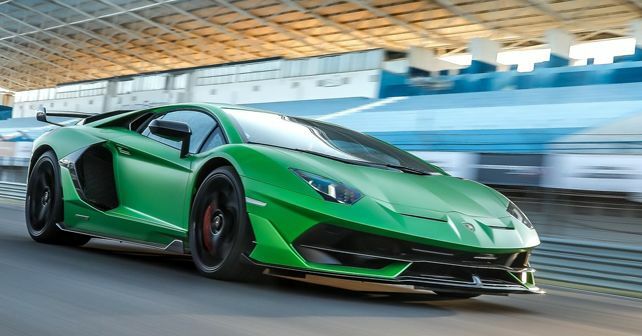 The SVJ gets Aerodinamica Lamborghini Attiva 2.0 which means it has active aerodynamics to help it reduce drag on the straights and downforce around bends. It even comes with four-wheel steering and independent suspension all around. The car sits on New Pirelli Pzero Corsa 255/30 ZR 20 92Y front and 355/25 ZR 21 107Y rear tyres. The SVJ features a hydraulically assisted variable dynamic steering system which changes its characteristics based on the different driving modes. The three driving modes are Strada, Sport, and Corsa, as well as the EGO setting which allows the driver to tailor each dynamic setting individually. The standard Aventador S Coupe was launched in India at just over Rs 5 crore and the Roadster was introduced at Rs 5.79 crore. Lamborghini Delhi has not released the price at which the SVJ has been sold in India. Although it is with certainty, the Aventador SVJ’s price in India is significantly higher.